Our Spring Break is winding down to a close much to the chagrin of my kids (and myself). But while we're still here, I tried to squeeze out every ounce of fun possible. I took the boys out to scour the antique shops, again, for photo props and cool vintage things. I'll leave that post for tomorrow. But today I was so psyched, what with this gorgeous 80 degree weather and my feeling extra energetic, well I just thought I'd throw in a little project for ya. 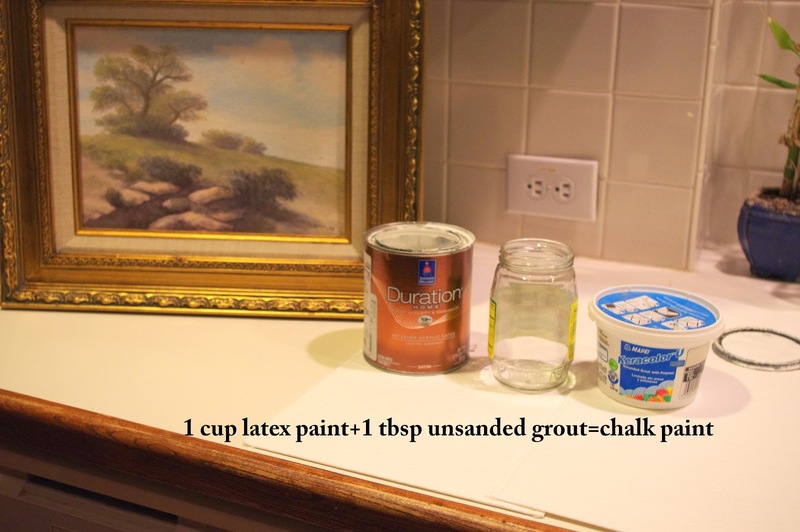 But let me tell you, you must mix/shake the paint for a good 3-5 minutes so that the grout can really mix with the paint. I took a $5 goodwill frame, popped the canvas painting out and taped off the material part of it. I then took a foam bowl, measured 1 cup in it, marked it with a pen (I did not want to ruin my measuring cups, so this is the method I used) then I took a plastic spoon and measured 1 tbsp the same way. Then I simply started to paint. The paint dries fast and had barely any clumps at all! I did a French White coat, let that dry while I made a batch of Grey. I put on the Grey coat making sure not to coat the white parts thoroughly. After that dried, I used some Minwax to buff and give it some sheen. In between coats and drying, I took the little canvas and sprayed chalkboard paint on it. I gave it three coats letting them dry in between. After all this I popped the little canvas back in and voila! I loved making my own chalk paint so much, I can't wait to make some more colors. The best part is that you don't have to prime or prep your surface really to use the chalk paint.